Like the rest of the North, Indiana actually prospered during the Civil War. No battles were fought here. No debt was incurred. War casualties were more than compensated for with new immigration from Germany. Even with the best of conditions, however, Southern Indiana couldn't escape the unrest and violence of this period of history. Some of Sherman's returning "bummers" failed to adjust to civilian life. Southern Indiana, for the first time, experienced banditry on a grand scale. During the Civil War, Quaker residents had encouraged free blacks to settle in the area. Both the blacks and the Quakers had been run out of Southern Indiana by 1870. From 1875 to 1893, "whitecaps" flourished in Southern Indiana. Like the Ku Klux Klan, the "whitecaps" wore white hoods to hide their identity. Many of the area's more prominent citizens were members of these secret societies, including local law enforcement officials. Their purpose was to "regulate" the private behavior of their neighbors through beatings, exiling from the county, terrorizing and--not rarely--lynching. The Branamans settled in Jackson County about 1820. This was a stable family, well respected in the community. most of the Branamans continued to be farmers. Two of Joseph's cousins--William Thornton and Lawson Frank Branaman--were local lawyers. William Thornton Branaman was the prosecuting attorney for one of the final whitecap cases in 1893, obtaining prison sentences against five men who beat Mrs. Dalton (one of the whitecapper's wives) nearly to death to settle a domestic dispute over money. Joseph's half-brother, Perry Branaman, was a witness at the Dalton trial. There is no indication that Joseph--or any of the Branamans--were whitecappers or sympathetic to their cause. Several of Joseph's grandchildren remember pieces of the story he used to tell about his exit from Indiana in 1881. Joseph was a personal acquaintance of the Brownstown sheriff. After dropping his cotton off at the gin one night, Joseph stopped by the sheriff's office where he lit a fire to get warm. While he was there he witnessed a lynching--possibly of several people. He discussed what he observed with one of his lawyer cousins who advised him to "get out of town." This conversation could have been several months after the incident. Whitecaps would traditionally give their victims warnings to "leave the county or else!" before resorting to violence. Joseph Weaver Branaman married Faith Martin about 1870 when he was only 18 years old. His mother, Juliet McDade Branaman, had recently died (May 14, 1869) and his father had re-married a few months later, starting a second family. Moses Branaman. Born about 1872. Wife's name was Ruth. Anna Branaman. Born about 1874. Married a Mickels. William Branaman. Born about 1875. Wife's name was Lottie. Bert Branaman. Born about 1877. Died in 1950. Cordelia Branaman. Born about 1878. Married an Emerson. Moved to Missouri in the early 1900's. Edward Branaman. Born about 1880. Died 11/1963. Clara Branaman. Born in 1881. Died 9/12/1945. She married a Glasgow. One letter written by Joseph to Faith in 1881 from Kentucky is still in existence where he indicates that he wants the family to join him after he is settled. It is possible none of his letters were ever delivered to Faith. He never received a reply. While in Kentucky, Joseph changed his name and started a new life. Faith later re-married a Mr. Hawkins. The First Baptist Church of Somerset, Kentucky was well known for its strong support of missionary work--particularly in the Western states. It is documented that the church had sent missionaries to Indiana. Joseph may have made contacts with church members while still in Indiana. Joseph's letter in 1881 indicates that he was studying for the Baptist ministry in Somerset, Kentucky. Although he remained a very active Baptist and song leader all his life, Joseph did not become a minister--apparently due to his marital irregularities. J. W. Branaman/Branhaman and his son James Aden Branaman were both attendees to the Twenty-Second Annual Session of the Baptist Missionary of Texas in Dallas, Texas in 1921. J. W. Branaman is in the first standing row - 3rd from the right with a long beard. James Aden Branamn is in the front row, 8th from the left with a piece of paper under his knee to keep his pants clean. Minerva Francis Taylor was the 11th child of 13 of James Taylor and Margaret Yeary. [See Taylor Family History.] [See Yeary Family History]. The couple was married 12/18/1883 in Monticello, Wayne Co., Kentucky. It is not known where they lived during the first years of their marriage. 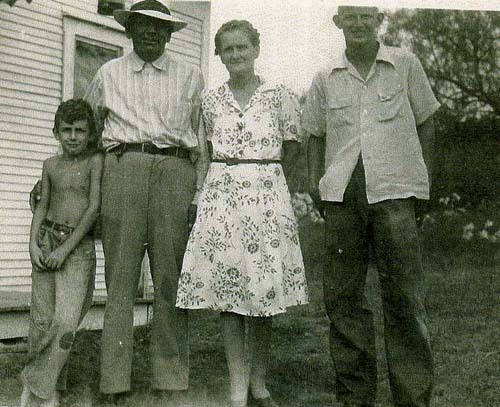 The family was living in Arkansas in 1888 when James Aden was born. They were in the Dallas-Ft. Worth area in 1890 when Juliette was born. Group photo taken about 1926 of J. W. Branhaman's family and various friends. J. W. Branaman and Minerva Taylor Branaman are the 3rd and 4th persons in the front row from the left. Minerva's sister, Amanada Taylor Metcalfe Storms, is the first person on the left in the first row; her second husband Jonathon Wilson Storms is sitting between Amanda and J. W. Branaman. The children in the front row, seated on the grass, are (left-to-right) 2 unknown children, Royce C. Lewis, Dorothy Lee Lewis, Jackie Branaman, and Dale Branaman. Glen Branaman is the older child sitting on a stump to the right and behind Dale. These are the younger children of Lee Ann Branaman Lewis and James Aden Branaman. In the second row (standing), James Aden Branaman is on the far left and his wife, Anna Susan Jennings Branaman, is the second woman on the left (in the big hat behind J.W. Branhaman.) The next 3 adults are unidentified followed (left-to-right) by the teenage cousins: Archie Branaman, Elizabeth Lewis, and Nestella Branaman. Juliette Branaman Miller is to the right of Nestella. Sanford Lewis is to the right of Juliette. In the third row are: Lee Ann "Leta" Branaman Lewis (behind Elizabeth's hat slightly to the left), Grover Cleveland Lewis, Leta's husband (next person to the right), and Edith Branaman Webb is to his right. Her head is between Nestella and Juliette. Joseph died in 1929; Minerva Taylor Branaman died in 1945. Minerva suffered a stroke during a special prayer meeting called to celebrate Victory in Japan Day. According to family stories, Minerva was 89 years old and hard of hearing. When she finally understood the reason for the prayer meeting, she got so excited she started shouting, "All my grand-children will come home alive and well." The excitement was such that she had a heart attack and died in a few days. 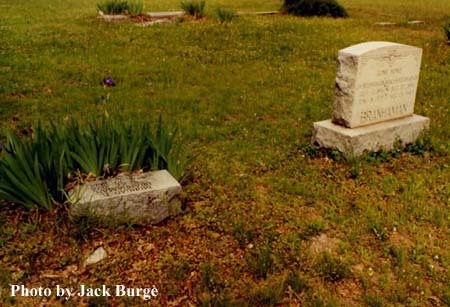 J. W. and Minerva Branhaman are buried side-by-side in the Lonesome Dove Baptist Church cemetery. Morgan's grave is adjacent to their headstone by the irises. The church is located on Lonesome Dove Road in a rural community just west of Grapevine, Texas. Anna Susan was exceptionally talented at needlework. [View "crazy" quilt started in the 1890's while she was still a teenager.] The embroidered figures represent symbols of her pleasures and values. Anna Susan and her girl friend stitched their crazy quilts as they shared secrets and dreams. The "man-in-the-hat" show below is her future husband, J. A. Branaman. Anna Susan and J.A. were the last to leave one Sunday after church services. 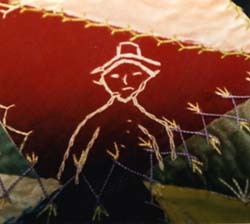 Ann Susan's budding love became part of her crazy quilt. Unfortunately, most of the stories are no longer remembered. But the teenage Anna Susan's ability to find joy and wonder in simple pleasures lingers in her crazy quilt. The first years of their marriage, they lived in then-rural Dallas and Denton Counties--just north of today's Dallas-Ft. Worth Airport. J. A. Branaman was called to the Baptist ministry in 1911. He attended the Baptist Missionary Association Theological Seminary in Jacksonville, Texas in 1914. Rev. Branaman pastored numerous rural Texas churches, including: Arbor, Teague, Talpa, Bronte, Crews, O'Donnell, McAdoo, Lanesville, Glen Fawn. He died of a heart attack in 1967 while riding with a friend to a religious gathering in Panola County, Texas. There were 7 children; 5 lived to be adults: 1) Eston Lee Branaman, born 1908 and died at birth 2) Nestella Ray Branaman, born 1909; married Loyd Jackson 12/11/1932; died 4/7/1958 (3) Eula Faye Branaman, Born 1912 and died a few weeks later 4) Archie Julietta Branaman, born 1915; married J. V. Vestal 3/3/1935; second, T. J. Mitchell 9/28/1945; and, third, Elmo Terry; died 3/31/2000 (5) Glen Taylor Branaman, born 1917, married Ottie Byers 3/5/1938 and, later, Peggy Pool; died 2/15/1999 (6) Dale Aden Branaman, born 1919, married Mabel Doris Van Leer 6/30/1939; died 2/17/2006 (7) Lois Ereldine "Jackie" Branaman, born 1921, married Jasper McWhorter 7/7/1944. 1937 family photo. 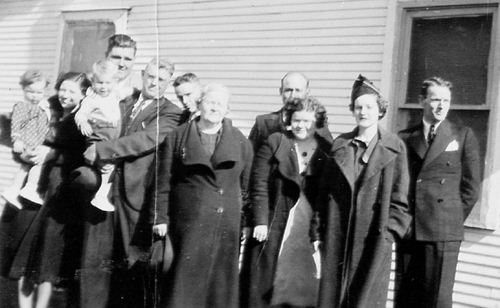 Left-to-right: Arlene Vestal (baby), Archie, Neal Jackson (baby), J. V. Vestal, James Aden Branaman (father), Dale, Anna Susan (mother), Loyd Jackson, Nestella, Jackie, Glen. 3) Margaret Juliette Branaman. (1890-1977). 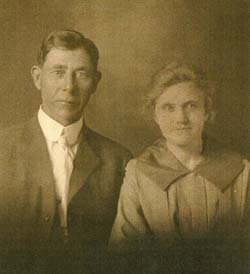 Married Sam L. Miller in 1918. The Millers were farmers. They had no children. Sam Miller and Juliette, c. 1925. 4) Morgan Eldon Branhaman. (1892-1932) Had polio as a child. Never married. 5) Lee Ann "Leta" Branaman. (1894-1992). Married Grover Cleveland Lewis, a Southern Baptist minister. There were 4 children: (1) Sanford Knight Lewis (1914-1989) married Jean E. Hutchinson (2) Francis Elizabeth Lewis (1916-2005) married Martin Seth Packer (3) Dorothy Lee Lewis, born 1922, married Nathan A. Ivey (4) Royce Cleveland Lewis (1925-1998) married Joan Williams. 6) Josie Edith Branaman. (1896-1979). Married James Ashley Webb. They had 2 children: Joe Alwyn Webb, born 1928 and Lloyd Ashley Webb, born 1935. The Webbs were farmers in the Dallas, Texas area. Lloyd, Ashley, Edith, and Joe Webb, c. 1945.